So, Mr. Stanley, I understand that you believe that the foundation of Christianity is not the Bible. Is that correct? Yes skeptical baby, that is correct. Additionally, Mr. Stanley, you have said that it was a mistake for Christian leaders to teach Christians that they ought to believe the claims that the Bible makes simply on the grounds that the Bible says so. Do you believe it is true that you should not believe something just because the Bible says it? So, to summarize your position Mr. Stanley, you reject the idea that the Bible is always true in all that it teaches and that Christianity does not need the Bible in order to exist? You believe Christianity existed before the Bible ever came into existence. That is correct. If Christianity never had the Bible, it would still exist. In other words, Mr. Stanley, you believe that if the Bible were proven to be false, it would have no impact on Christianity. Well, there is no evidence of the global flood, there is no evidence of the exodus, and stories like Sodom and Gomorrah seem far removed from what we know about the loving God who sent his Son to die for the sins of the world and whom God rose from the dead. I see. For the record can you just answer the question as it is stated to you? Would Christianity continue to exist if it was demonstrated that the Bible was false? Yes, skeptical baby, it would exist and here is why; you see, its all about the event of the resurrection of Jesus Christ. That is what Christianity is founded on. The historical event of the resurrection is what Christianity is really all about. I see. Now, Mr. Stanley, I have one more question for you. How do you know that Jesus Christ is in fact the resurrected Son of the Living God? 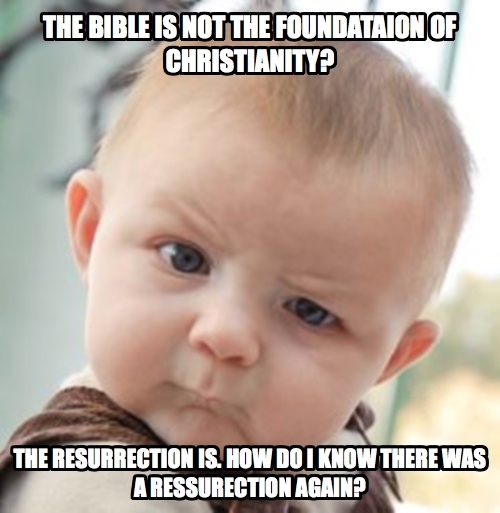 Well, skeptical baby, all the gospels tell us that Jesus rose from the dead. If the Bible is reliable, then belief in the resurrection of the Son of God is warranted. And if belief in the resurrection of the Son of God is unwarranted, then Christianity is without justification. Therefore, Christianity is without justification. Now, since you have demonstrated that belief in Christianity is unwarranted, don’t you think you should close your church and abandon your belief in Christianity. Now your just twisting my words. No, Mr. Stanley. If anyone is twisting someone’s words, sir, it is you! Biblical Christianity (BC) promises to tell the truth, the whole truth, and nothing but the truth. BC, do you believe that the Bible is the foundation of Christianity? Yes, skeptical baby, I surely do. BC, surely you are aware of William Clifford’s rigorous view on the ethics of belief: “It is wrong always, everywhere, and for anyone, to believe anything on insufficient evidence.” Do you agree that it is unethical to believe anything without sufficient evidence? Not always. Clifford is mistaken. You see, skeptical baby, Clifford lacks evidence for the ethics behind his belief. So on his own belief, his statement is actually self-referentially incoherent. But more important than that is the fact that we do believe all sorts of things without any evidence and if we did not, knowledge would be virtually impossible. Basic beliefs do not require the sort of inferential support that Clifford claims. We would end up asking for evidence for the evidence, and evidence for that evidence, and this would lead to an infinite regress, a chain of evidence without a beginning or anchor. Be that as it may, BC, do you have any evidence that the Bible is the foundation of Christianity? Actually, skeptical baby, I do. The apostle Paul wrote in Eph. 2:20; “So then you are no longer strangers and aliens, but you are fellow citizens with the saints, and are of God’s household, having been built on the foundation of the apostles and prophets, Christ Jesus Himself being the corner stone, in whom the whole building, being fitted together, is growing into a holy temple in the Lord, in whom you also are being built together into a dwelling of God in the Spirit.” There is a lot more than just this evidence, but this is more than sufficient to show that the foundation of the Christian Church is the teachings of the apostles and prophets, which is also what we call in modern vernacular, the Bible. Objection, your honor! BC is using the Bible as evidence to prove that the Bible is the foundation of the Christian Church. This is circular and therefore logically fallacious. OBJECTION OVERRULED! BC’s use of the Bible to prove the Bible is no more circular than your use of reason to argue for the validity of logic. Continue your cross, skeptical baby. BC, if the Bible is proven to be false in any way, what happens to Christianity? Skeptical baby, if the Bible is proven to be false in any part, in any way, then all decisions to believe the Bible in part or in whole are left to human beings. It then becomes our privilege to judge which parts of the Bible are sound and which parts are spurious. If the global flood is false for lack of physical evidence, and so too is the exodus, then how could I claim that the resurrection is true and avoid the charge of being arbitrary. But don’t we have evidence that Jesus actually did raise from the dead apart from the Bible? Actually, skeptical baby, no, we don’t. What we have is evidence that Jesus’ followers believed and claimed that he rose from the dead. That is the best we can do where those external sources are concerned. The actual evidence for the resurrection of Jesus Christ is only found in the Bible. There is another argument that probably merits mentioning here. That is 1 Corinthians 15. In that text, Paul is arguing for a future resurrection based on the evidence of the resurrected Christ. In that text Paul is basically dealing with a false doctrine that denies any future resurrection from the dead. In order to refute this doctrine, Paul appeals to the established fact that Christ rose from the dead. The foundation for his presupposition of the resurrected Christ is found in 15:3; and that He was buried, and that He was raised on the third day according to the Scriptures. Paul is appealing to the Scriptures as his proof that Jesus rose from the dead. If the Scriptures are unreliable, they would should not be appealed to as the truth by which such arguments can be refuted and contradicted. I see. No further questions. Wait, I have one question for Andy Stanley. Mr. Stanley, you said that you do not believe in a literal Adam and Eve because the Bible says there was a literal Adam and Eve, but because Jesus believed in a literal Adam and Eve. Jesus said that the Scriptures, that is, the law, the prophets, and the writings, cannot be broken. In other words, Jesus said the Scriptures were true in all that they taught. So here is my question: if you believe in Adam and Eve because Jesus believed in Adam and Eve, why don’t you believe that the Bible is true in all that it teaches because Jesus believed that the Bible is true in all that it teaches?